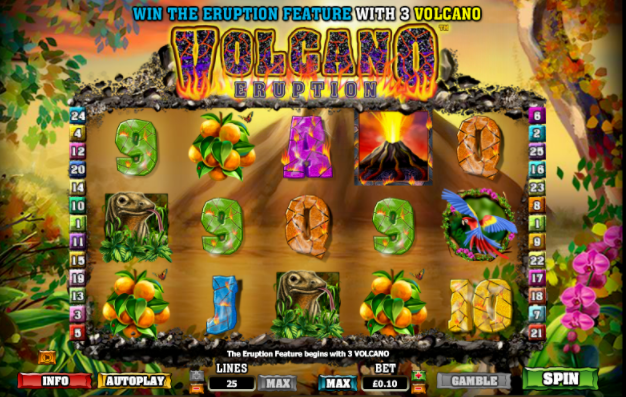 Welcome to Volcano Eruption, one of the hottest online slot games on the planet. Dodge flaming lava balls and pulsating magma spurts to take advantage of the constant stream of white-hot free spins while encountering tropical snakes and monkeys in this bubbling online 5 reel slot game. 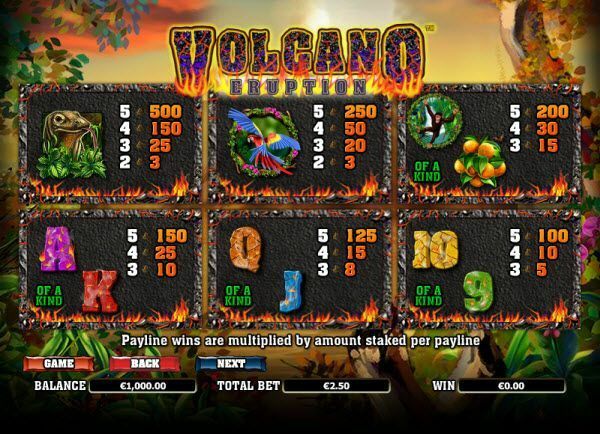 Volcano Eruption is powered by the on fire NextGen Gaming who are at the top of their game right now with Volcano Eruption just another smokin' slots game to add to their list. NextGen Gaming pride themselves on maintaining the balance between gaming innovation and the ‘proven fundamentals’ to create fun online slot games. With a philosophy of ‘Attract,’ ‘Entertain,’ ‘Retain,’ this developer strives to create an environment that players would want to return to again and again. Founded in 1999, NextGen was one of the pioneers of platform-specific gaming, creating a community of inspiring work, and gaming innovation. Recently joining hands with Poker Stars New Jersey, USA. Classic games like Doctor Love and Mad Monkey are some of the more well-known titles from NextGen – with hopefully more to come in the future! If you want to play slot games then you can't go wrong with NextGen. Volcano Eruption is presented in a way that shows that it is trying to mimic a theme that is quite similar to something like an Aztec or Mayan influence. With mystical sound effects, as well as the beating of tribal drums, it is easy to suggest that this is the case. With an art style that is actually just a little too messy to play for long periods of time, the rewards are definitely worth playing this for at least a while. The background sees you standing at the foot of an active volcano – hence the name of the game – surrounded by dense jungle. The symbols are reminiscent of this ancient theme, while at the same time maintaining the classic lettering and numbers from casino slots. Some of the other symbols, however, are well-known animals that live in forests; parrots, monkeys and lizards are present, just to name a few. Overall, the sound effects add to the atmosphere of the game, but the art is just a little too realistic for it to be nice to look at. Functioning on a 3 x 5 reel system, the game has rewards spread over twenty-five pay lines. With the regular special symbols present, we see multiple ways to increase your winnings… Take full advantage of them! The Wild, for example, is the Eruption. Appearing on reels 2, 3, and 4, this substitutes all other symbols on the board. When you get three, however, the centre volcano erupts, filling the whole column with the Wild symbol; this is very useful for us players! When this happens, five re-spins occur, while the centre column stays fully wild. It also erupts, spreading more wilds around the board. This is incredible! Of course, after winning the eruption feature, if you are in the mood to try your luck, you have the choice to activate the Gamble option. If you guess the colour or the suit of the next card that appears in front of you, you can double your winnings! Be warned, however – you are only allowed to do this five times, so use them wisely. With a fairly simple online slot game, with just one special unique feature, the player really feels like they are going back to basics with this one. With a minimum bet of just a penny and a maximum of £50, there is no reason not to hope you strike lucky with the hugely beneficial eruption feature. Good luck! For a change from all this volcanic action try our Disco Disco slot instead or you can Click here to learn more slot games that we have here in Easy Slots.